Nick has been a part of the Topcoder Community team for almost 3 years now. He’s usually the voice you hear at Topcoder events and face you see when watching live interviews. I know you became a part of Topcoder in 2015. 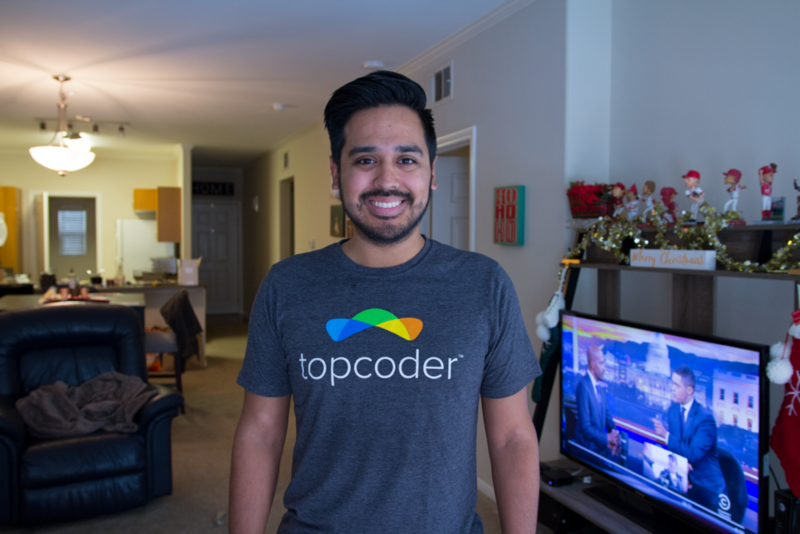 Tell me a little bit about your background and why did you decide to join Topcoder. What’s your typical work week like? Before Topcoder I worked for a security company as a Java Developer. I then moved into more of a product manager role in their R&D department where we were creating innovative ways to gain access into a locked door. One of my ideas involved using Bluetooth Low Energy (BLE) and social profiles for a lock, to identify who you are and unlock as you walk to the door, provided you had the right permissions. I was able to get an MVP built in 2-3 months, but how? With Topcoder of course! This was my first experience working with Topcoder as a customer and being able to communicate with copilots and members to create an idea to its fruition was pretty amazing. I knew this was the way companies would be getting work done in the future and wanted to hop on board and do my best to make Topcoder the #1 choice both for participation and work accomplishment. I believe that the fun challenges that we have been releasing are really helping bringing in a new class of developers. I would also say that the events that our Topcoder Evangelist, Harshit Mehta, is doing in India is really creating a buzz and attracting new members. Having member programs such as the Cognitive Community and Blockchain are also very attractive to potential members as well! You’ve been attending and organizing a couple of regionals events during the last 2 years. Which one was your favorite and why? Great question! Of course every TCO Regional is different and great in their own respects, but I have to give it up to the India TCO Regionals. Having part of the Topcoder Team in India really helps with this. I know the kind of effort they put into this one day event to make it great for our members, and it really shows. The one year I attended they even had a cut out of me where members could put their faces in as my face! Pretty creative!! India also has one of our biggest TCO Regional Events in terms of turnout, I’d like to see another country compete for that title! What do you like most about Topcoder in general, and about what your job role entails specifically? I am the type of person that gets pleasure out of seeing other people happy. 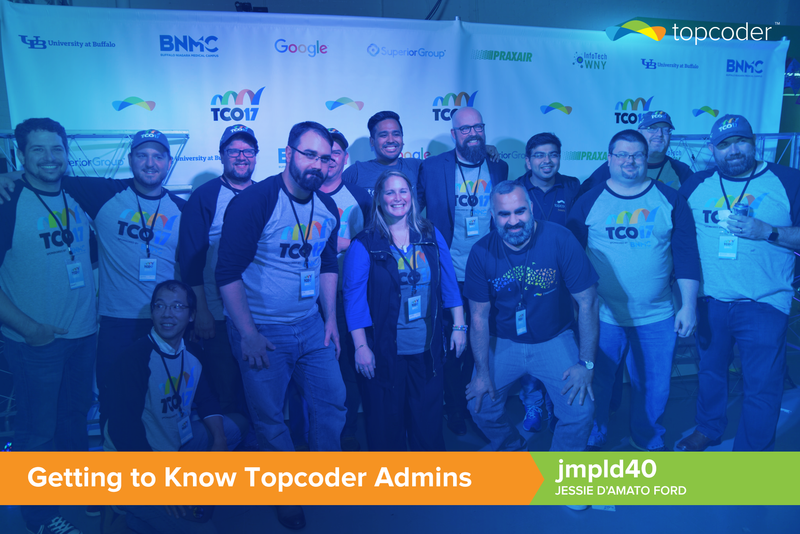 What gets me really excited is when I get to meet Topcoder members in person and when they speak so highly about the platform and how much they have learned and enjoy what they are doing. The passion that our members have to compete and learn is so amazing and fascinating to me. 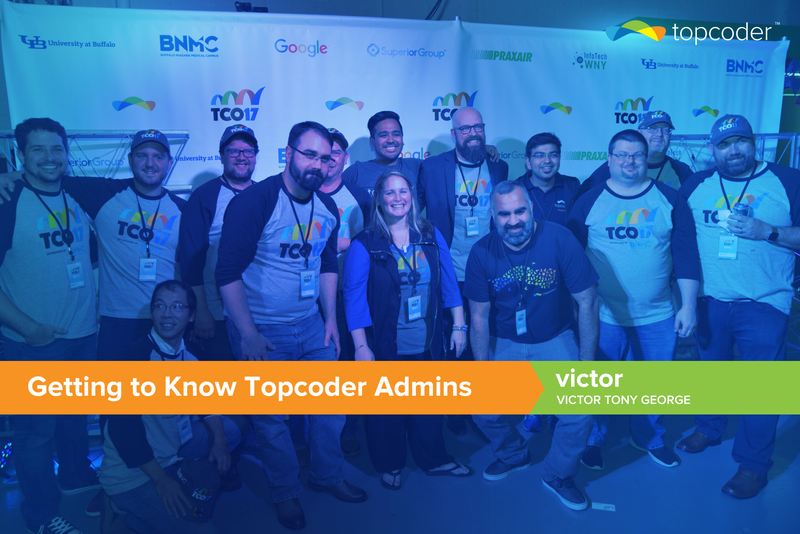 What I enjoy about my role in the company is that I get to work with both the members and my team to create what I believe will make Topcoder the premier site for crowdsourcing and competition. Obviously there are some barriers now and we have to prioritize some things over others, but I feel like we are moving in the right direction. What’s the most difficult/challenging thing you do as the Community Manager? How do you push yourself to become better? Personally I would say communication with the members is something that is particularly challenging, because when the Community Team needs our members to know a particular piece of information or an announcement, we place them all over in hopes that it reaches them (Social Media, Forums, Slack, etc), although we still get messages like “We didn’t know this was happening”. To become better at this, as I mentioned above, we will be incorporating a lot of these types of announcements on the My Dashboard page, which will be sure to reach all of our active members. When/where was the best moment that you have experienced with Topcoder members? Well, seeing as I only see Topcoder members at our events, I would have to say this past TCO17 Finals event. I think by being around Topcoder for 2+ years now, the members have finally started recognizing me and becoming comfortable talking to me. I love hearing about everyone’s story, how they started with Topcoder, and even listening to the feedback that they have for the site. I hope to meet, speak to, and take pictures with all our members reading this at future events! You are the speaker for all TC events. Are your MC skills natural or acquired? Do you feel nervous about announcing TCO finalist handles the wrong way? First off, thank you for asking if my MC skills are natural because I don’t think I’m that great at it, but I’m trying to get better! I was never a good public speaker but I feel, with each TCO Finals, I am getting a little better. Pronouncing Finalists names are ALWAYS a nerve-racking situation, but that is why I either ask that person directly when I meet them, or I follow the phonetically spelled version that they have provided to Jessie. Pro tip: If you don’t send Jessie the phonetical version of your handle, chances are I will botch it up! Obviously most people will remember my biggest mess up at TCO16 in Washington DC, where I announce RNG_85 instead of RNG_58. The people watching on the Livestream were having a field day with that one. Where do you see yourself in 5 years? What are your goals for the future? Haha, now I feel like I’m interviewing for another position. Wow, 5 years huh? With the rapid growth of technology nowadays, I feel like I’ll be hosting TCO either on Mars or in Virtual Reality. I am obviously content with what I am doing now. I may like to move more into a role that would incorporate some work as a product manager from the Community side of Topcoder so that I can quickly build out features that will help our community operate and grow at a faster pace! As a community manager, you must certainly have interacted with many members. What would you say is the most valuable lesson you’ve learned from any member(s), either personally or professionally? If at first you don’t succeed, dust yourself off and try again. Ok, well maybe that was a song lyric from the late Aaliyah, but the same thing applies. By talking to many successful members on Topcoder, I have discovered a certain theme, which is failure or unsuccess is no reason to quit. The stories of these members when they completed their first challenges and have perhaps not won, took that as a learning experience in that particular technology. They weren’t focused on not having placed and winning money, but rather thinking “I was able to submit, I didn’t have the best submission, but I will learn why and next time my submission will be better and perhaps I’ll begin succeeding.” It is a great mentality to have with anything really. How would you convince someone to join Topcoder in 5 words? Great Prizes, Competition, and Community.